Sam Allardyce expects West Ham's owners to show patience with him as manager, but admits speculation over his position is understandable. The Hammers sit 17th in the Premier League and the three clubs below them have changed managers this season. "Everybody will speculate about my position," said Allardyce, whose side have one win in eight league games. "The owners have always shown patience in difficult situations, I hope that will be the same - I'm sure it will." A 4-1 defeat at Liverpool on Saturday left West Ham above the relegation zone on goal difference ahead of this weekend's visit of fellow strugglers Sunderland. After the same number of games last season, Allardyce's side sat 10th, with nine more points than they have achieved this term. 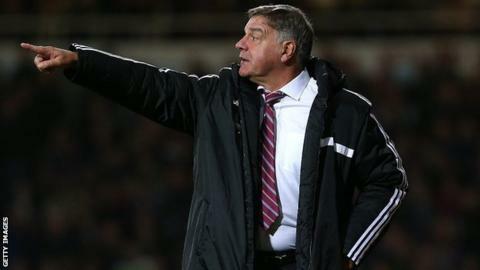 "I wouldn't have thought I would have needed a discussion about my future with the owners," added Allardyce, who succeeded Avram Grant as manager in 2011 and led them to promotion in his first season. "They are going to stick with me or they are not, it is entirely up to them and how they see me in the job and how they see the situation at the moment. "I know that in the end it is about us getting results again to alleviate the pressure on us all." The departures of Paolo Di Canio at bottom club Sunderland, Ian Holloway at 19th-placed Crystal Palace and Martin Jol at Fulham in 18th, have increased speculation that Allardyce could be the next manager to leave his post. He has been without record-signing Andy Carroll for the entire campaign because of injury, with his side scoring just 13 times in the league this season. Only Crystal Palace, Sunderland and Cardiff have found the net less. "It is the first time we have had a bad run in the two and a half years I have been here," added Allardyce, 59. "It comes and it will happen, we have got to make sure we are determined enough and have the right desire to overcome it."